Back toward the end of 2017, we were talking about how Modern prices were dropping fast. The average price of buying one of the 12 most played decks in the format was down from $1,015 in 2015 to $790 in November 2017. Wizards' concerted effort of reprinting staples to make the format more accessible was finally bearing fruit. While still not cheap, building a tier Modern deck was becoming a realistic dream for more and more Magic players. Since then, in just a few short months, things have taken a drastic turn for the worse. In fact, if you look at the average price of a top-12 deck today, the price is all the way up to $984—a staggeringly huge increase of 26% in just a few months. This means that the Modern format today is nearly as expensive today as it was back in 2015—the peak of the "Modern is too expensive, we need more reprints" movement. In fact, back in 2015, I wrote an article showing how Modern prices increased 25% in six months, thanks in large part to the lackluster Modern Masters 2015 set. While you can check out the entire article if you are interested, the TLDR is that Wizards didn't just need to reprint more Modern cards (Modern Masters 2015 had just been released); it needed to reprint better Modern cards. This lesson seemed to be learned with Modern Masters 2017, perhaps the greatest Masters set since the original Modern Masters, but as the past six months show, lessons can be forgotten just as easily as they can be learned. As we talked about in the intro, the average price of the top 12 most played decks in Modern has increased 26% since November 2017. However, this number is overly simple, since decks move in and out of the top tiers of the format on a regular basis. It's possible that some of the cheaper decks in the format have fallen from the top tiers of the format and that more expensive decks have taken their place, so rather than just relying on the average, let's take a peek at the top decks in the format individually. *Ironworks Combo, Mardu Pyromancer, Bant Spirits, and RB Vengevine are not included, since they weren't popular decks in November 2017. Much like the average deck price, individual deck prices aren't a perfect measure. In theory, a deck could replace a cheap card with a more expensive card, and the total deck price would increase as a result. However, this seems unlikely when you take the data as a whole. As you can see in the above chart, prices for tier decks are up almost across the board. While Dredge and Storm (the two cheapest tier decks in the format) are exceptions, all of the other decks have increased in price over the past nine months, and many prices of the top decks in the format have not just increased but increased dramatically, being up 40% or even 50% in price. In sum, the nine decks listed above increased by an average of 25.99% since November 2017—a staggering amount in a very short period of time. The fact that the increase was so consistent across the top tier decks means the odds that this increase can be attributed to decks trading out cheap cards for expensive cards is tiny—a much more reasonable explanation is that Modern is getting more expensive and less accessible by the day, but if you're still not convinced, we can go one level deeper. Need more convincing? Just taking a look at Modern Masters 2017—the last great Masters set and a set overflowing with Modern staples—should be enough. The total set price of Modern Masters 2017 lines up almost exactly with our average deck price increase, with the set increasing 24.9% in value since November 2017. Still not enough? Here are the top six decks in the format, with all the rares displayed card by card, so you can see in-depth just how crazy this price really is. I considered doing more decks, but it's tedious work, and based on our other data, we should expect that the result for most decks would be similar. As you can see, even on a card-by-card level, the price increase is pretty insane (actually, at least for the top decks in the format, the increase looks even worse on an individual card basis). A couple of thoughts on this before we move on to the cause of and solution to our price problems. First, I left Jeskai Control off the list, since it has essentially the same rares as UW Control but with a couple of extra lands. The chart would look almost exactly the same. As you can tell, I added in a couple of uncommons but only in extreme cases, like Krark-Clan Ironworks and Goblin Lore. One fair criticism of these decks is that some of them are better now than they were back in November 2017, and this is true. Ironworks Combo was a fringe deck back in November, and so was Hollow One (the rest of the decks were roughly in the same tier in November as they are today). To head off this criticism, I decided to take a peek at the decks that have dropped furthest in the metagame over the past nine months. Lantern Control is the biggest loser, being the 12th most played deck in the Modern metagame back in November and not really a deck at all today. Despite this drop in play, Lantern Control still increased in price from $846 to $1,088—a 28.6% increase—outpacing our current top 12 decks in terms of price growth. Affinity is another example, going from the 2nd most played deck in November to the 16th most played today while also increasing in price from $680 to $930, a 36.7% gain. Finally, Counters Company went from 11th most played to 33rd most played while increasing from $811 to $981, a 20.9% increase. So, while some of our current most played decks have gained in popularity over the past several months, even the decks getting markedly less popular have greatly increased in price. The most shocking part of these numbers? We had not just one but two Masters sets released during this time (one in November and one in March). Traditionally, Masters sets make the format cheaper, at least temporarily, but it seems that Iconic Masters and Masters 25 missed the mark (but more on this later). In many ways, the massive Modern price increase is a perfect storm of factors. Modern is an extremely popular format. Modern leagues on Magic Online regularly have more players than Standard leagues. StarCityGames recently decided (with much success) to change up its SCG Tour to focus primarily on Modern. In just the past six months, we had a Modern Pro Tour and a team Pro Tour, in which Modern was heavily featured. Demand for Modern has arguably never been higher, and more players being interested in (and playing) the format means more players buying Modern cards, which in turn causes prices to increase. However, the issue isn't primarily about demand. While the popularity of the Modern format is certainly playing a role, the bigger issue is that 2017 was the year that Wizards somehow forgot the lessons of 2015 and stopped reprinting Modern staples. Up until the winter of 2017, Modern Masters sets were a recurring theme, coming like clockwork every couple of years to reprint Modern staples and keep prices in check. However, things changed in a meaningful way toward the end of 2017, with the announcement that rather than Modern Masters, we'd be getting "themed" Masters sets like Iconic Masters and Masters 25. This shift was huge for two reasons. First, moving away from Masters sets that were filled exclusively with Modern cards meant that, rather than using Modern staples like Tarmogoyf and Mox Opal to sell the set, the chase cards in Masters sets shifted to cards that were expensive primarily because they were old and in low supply (as opposed to Modern staples, which are expensive due—at least, in part—to high demand), like Imperial Recruiter and Mana Drain. 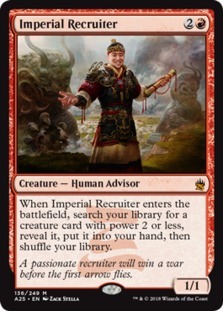 While having more Imperial Recruiters in the wild is not a bad thing, these type of reprints don't do anything to help keep the price of Modern in check because the cards aren't even legal in the Modern format. Second, Masters sets got worse in general, and players are losing interest in paying $10 a pack for a set that is premium in name only. Iconic Masters was widely held to be a mediocre set, to the point where Wizards actually issued an apology and promised that Masters 25 would be the themed Masters set we were waiting for. Then, Masters 25 spoilers happened, along with the infamous Tree of Redemption at mythic debacle, and the community's reaction to Masters 25 was perhaps even more negative than it was to Iconic Masters. Compare this to Modern Masters 2017—which was widely held as one of the best Masters sets printed since the original Modern Masters, since it was overflowing with not just value but valuable cards that people actually needed to play one of Magic's most popular formats, like fetch lands—and the differences are stark. One of the underestimated aspects of sets like Modern Masters is that their very existence helps to depress prices, even if some staples manage to dodge reprinting in any individual set. When it comes to MTG finance, the primary risk of buying a card is that it will be reprinted and drop in price. Modern Masters—by its very nature—sent a clear message that any staple in Modern was likely to be reprinted within a maximum of two years in the next Modern Masters set. Since themed Masters sets contain comparatively few Modern staples, the risk of reprinting is greatly diminished, which makes speculating on Modern cards significantly less risky (just take a look at the absurd price spikes of Reserved List cards to see what happens when the risk of reprinting is removed from the equation altogether). This isn't to say that speculation is the only cause of these price increases or even the primary cause, but there's little doubt that seeing the near-complete lack of Modern staples in Iconic Masters and Masters 25 looks a lot like a green light when it comes to buying Modern cards for financial purposes. This being said, just to be extra clear: it's really a combination of factors involving both supply and demand that have cause the absurd price increase of the past few months. 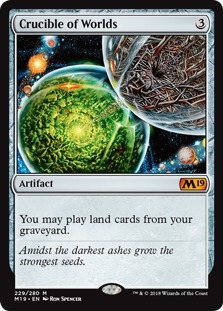 With demand from Modern Pro Tours, SCG Tour support, and the massive popularity of the format in both paper and Magic Online, combined with supply issues from the sudden lack of Modern reprints in Masters sets, with both players and finance types buying Modern cards, you have a sort of perfect storm, where the Modern format shoots up in price (and down in accessibility) in a very short period of time. While the problem is a combination of high demand and lack of new supply, the solution is completely on the supply side. Modern being in demand among players is a great thing—trying to make the format less popular to diminish demand would be silly. This means that the only realistic way to fix this problem is by increasing the supply of important Modern cards by reprinting them more aggressively. 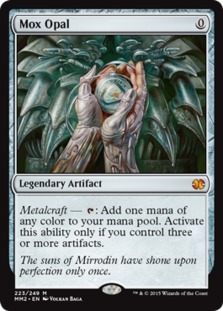 While seeing cards like Crucible of Worlds and Scapeshift in Core Set 2019 is great, the sad truth is that most Modern staples would be too good for Standard (see: the problems caused by Mutavault and Thoughtseize in the not-too-distant past). While I expect that the Modern cards that are safe for Standard will be reprinted in Standard over the next few years, primarily in core sets, since they provide an easy way to increase the value of the set that also makes players happy, most Modern staples need to be reprinted in a supplemental product for the sake of the Standard metagame. While we see Modern staples show up in random Commander decks or supplemental products like Battlebond every now and then, the burden falls mostly to Masters sets—the product initially designed specifically to reprint important Modern cards. The easiest solution would be to return Modern Masters to the Masters set rotation so that players (and speculators) know that a bunch of staples will be reprinted at least every couple of years, but this isn't the only solution. If Wizards wants to stick with themed Masters sets, it needs to double down on reprinting Modern staples in these sets. Take Iconic Masters and Masters 25, for example. Iconic Masters had a handful of Modern staples in Thoughtseize, Cryptic Command, and Horizon Canopy along with more fringe cards like Bloodghast and Ancestral Vision. Meanwhile, Masters 25 reprinted Chalice of the Void, Ensnaring Bridge, Blood Moon, Thalia, Guardian of Thraben, and Eidolon of the Great Revel. Compare this with Modern Masters 2017, which had all of the fetch lands, Liliana of the Veil, Cavern of Souls, Snapcaster Mage, Tarmogoyf, Damnation, Goblin Guide, Death's Shadow, Stony Silence, and a bunch of other fringe but playable cards, and the difference is clear: Modern Masters 2017 had not only more Modern reprints but better Modern reprints. So far, themed Masters sets simply aren't meeting the need for Modern reprints, which is driving up prices and making the format much less accessible for the average player. 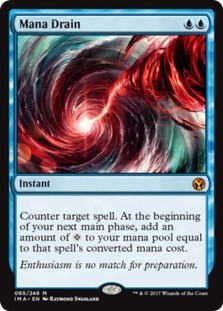 The good news is that with loose themes like "Iconic" and "25th Anniversary," Wizards could easily make themed Masters sets into functional Modern Masters sets without having to backtrack. Mox Opal and Karn Liberated are more iconic than most of the cards in Iconic Masters anyway, and Liliana of the Veil or Snapcaster Mage should have filled the Innistrad slot in Masters 25 over Tree of Redemption. Wizards can keep making themed Masters sets and still meet the needs of Modern players—it's just going to take some work on Wizards' end to make sure the focus is on getting players the reprints they need to play Modern, rather than on reprinting cards with deceivingly high value that few players actually want, like Imperial Recruiter and friends. Back in 2015, Masters sets were failing because they didn't have enough good Modern reprints. 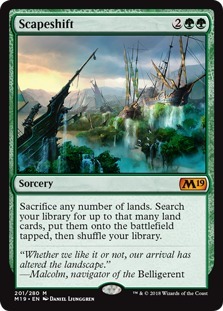 Today, we have a two-headed problem: we're not getting enough Modern reprints in total thanks to the move away from Modern Masters, and the Modern reprints we do get are middling (see: filter lands over fetch lands, for an easy example). Step one to fixing the problem is Wizards refocusing the Masters series on Modern, and this needs to happen soon. Anyway, that's all for today. Over the past couple of years, I've been praising Wizards for its ability to decrease the price of Modern and make the format more accessible to the average player. Things have changed in the past few months. A 26% increase in less than a year is stunning. After years of gradual improvements, something has gone extremely wrong in a very short period of time. Hopefully, Wizards realizes that this is a problem and redoubles its reprint efforts to give the players the cards they need to play the best format in Magic at a reasonable price. If not, the glory days of Modern could be nearing an end, as new players are priced out of the format and existing players find it increasingly difficult to change decks. As always, leave your thoughts, ideas, opinions, and suggestions in the comments, and you can reach me on Twitter @SaffronOlive or at SaffronOlive@MTGGoldfish.com.